Today was a low productivity day, but I’m okay with that. My brother is stationed in Iraq until next summer. He was on-line this morning and really wanted to play games. We spent almost two hours playing an on-line version of Pictionary. How fun! After he went to bed, I washed the dishes and picked up around the apartment. I spent an hour learning Japanese this afternoon and then took a nap. Hubby’s receiving emergency work calls almost every night and we’re both really tired. So all in all it’s been a very quiet day. I’m trying to remember that relationships are more important than feeling like I’ve been productive enough. I have a hard time relaxing when I feel like I should be doing something. But taking a nap with my husband or spending some time playing games with my brother (who I won’t see for another year!) is way more important than a pristine house. Now if I can just learn how to actually relax! Why is it that house guests wear me out so quickly, even when I love them? I wouldn’t trade this time for the world, but the pace of our days is much busier than I am used to. Combine that with my increased exercise these past two weeks and Sabbath couldn’t come at a better time. We’ve already been really busy. Wednesday evening, hubby and I took my brother and his wife to the Phoenix Art Museum. When we finished exploring the museum, we stopped by the library, Whole Foods, Starbucks, and ColdStone. No worries; I’m being strict with my diet and didn’t partake in either Starbucks or ColdStone but both smelled really good. Thursday morning, we completed a 45 minute cardio session with a P90X DVD. The workout didn’t seem as hard as the Jillian Michaels’ 30 Day Shred DVD. The P90X cool down left much to be desired so we left the house and walked 2.5 miles. In the afternoon, I taught my brother and his wife how to play one of my favorite games – Ticket to Ride. They seemed to enjoy it and my hubby and I enjoyed the opportunity to play with four total players instead of our usual two. Thursday afternoon saw me spending another hour or so finishing up my mom’s cloth napkins. Then we all carpooled up to The Cheesecake Factory to celebrate Mother’s Day with my mom. The restaurant has really good hummus. I wish I could figure out how to make my hummus taste like that. After dinner, hubby, myself, my brother, and his wife all stopped into Macy’s to search for a birthday present for my mom. Her birthday is the second week of June but we will be celebrating it over Memorial Day (along with my dad’s birthday and Father’s Day). My brother is traveling to Iraq the first week of June so we are cramming a bunch of celebrations into one long weekend at the end of May. This morning I skipped my exercise. I was just too tired from all the running around we’ve been doing. Thankfully, I’ve been waking up about 20 minutes before the rest of the house so I’ve had quiet time each morning to read from the Bible. That’s a nice blessing. Later this morning, my brother, his wife, and I visited a nearby mall looking for the present he couldn’t find last night. After an hour and a half of visiting nearly half the stores in the mall, we declared it an unfruitful trip. At least we got a lot of walking! Now my brother and his wife are off to pick up his daughter. They, my mom, and her boyfriend are going to a concert tonight. Hubby should be home any time now, as soon as he finishes with his client. Because I’m the only one home, I took the opportunity to catch up on dishes and tidy up the kitchen. Then I decided I might as well vacuum. While vacuuming, I figured I might as well sweep the kitchen and clean out the cat litter boxes. Even though I’m very tired, the work kept calling my name and it’s a pleasure to know that my hubby will return home to a clean house and a calm wife. I think I’m going to read for awhile until my hubby calls to say he’s on his way home. I picked up several Christian nonfiction books about marriage and homemaking and I’m excited to see what I can learn. I hope everyone has a fantastic weekend and a very restful Sabbath! I am so excited. Finally, after much delay and a bit of procrastination, I have finished my first set of pillowcases (used this pattern). The first one was completed several weeks ago, but I procrastinated on finishing the second pillowcase and then took an emergency trip to Texas. I bought this fabric years ago, I think while I was still in high school. 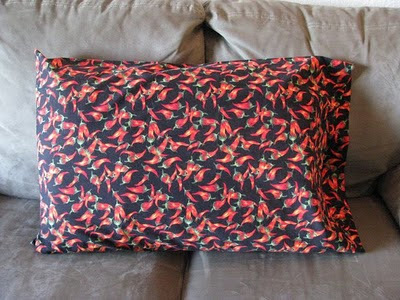 My plan was to sew two pillowcases for my brother, as he was obsessed with using chili peppers to decorate his bedroom. I don’t know why I waited so long to start these, but hopefully he still likes them. If not, he will at least appreciate the humor in his old decorating taste. If I have the time tomorrow, I’m going to hand wash the fabric for my grandpa’s quilt. Then I can start cutting out all the squares I will be sewing together. Hubby’s working today so I’m at home by myself. It’s so quiet when it’s just me here! I can tell the cats are hot during the day because they sleep on the tile for hours at a time. I’m hot too but it’s not too bad. So far today I’ve washed the dishes, cleaned off the kitchen counters, picked up the living room, washed a load of laundry, vacuumed the apartment, and opened yesterday’s mail. I don’t think I’m going to tackle any additional housework today except cleaning out the catbox before hubby comes home. Yesterday, we visited the Sunflower Farmers Market. They have some great sale prices! We brought home some apricots, nectarines, apples, tomatoes, lettuce, and bell peppers. We also found that Sunflower carries the entire line of Simply Asia products. We used to buy them at Sprouts but they have since stopped carrying them and Walmart only carries two varieties. Sunflower had them on sale plus each box had a coupon for saving a dollar instantly. We bought four boxes! My favorite variety is the Soy Ginger noodles, though that may change once I try the new flavors. I’m plowing through my library books. Between hubby and I, we currently have 48 books checked out. The library allows 50 books per library card (we have two), so we could bring more home but I would never be able to finish everything. Sometime this week I’m going to post about a couple of the books that I thought were exceptional. Whew! What a week! I am completely exhausted. I have a few things that I want to post about but I just don’t have the energy. Tomorrow may or may not be a laid back day, but Thursday is going to be packed. I think Friday might be our first quiet day but even that is debatable as I will need to clean for the Sabbath. It looks like all our house guests will be gone by the end of the weekend. Getting back to regular blogging is one of my requirements for next week. My hubby, brother, Dad, and I have been geocaching today. My brother got me hooked on it last year when he took me out on a couple hunts. I haven’t searched for that many caches, but every time we get together, we search for a couple. Today we found five! 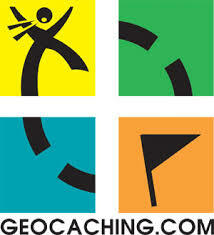 If you haven’t tried geocaching, check it out. It’s a lot of fun, anyone can participate, and there are geocaches all over the world! We don’t have GPS but we can still participate by finding the general location and then following the clues. It’s a wonderful treasure hunt. My brother arrived at my house safely this evening. He and my dad were supposed to drive up to Wyoming tomorrow morning for my grandma’s birthday. Unfortunately, my brother’s truck died once he reached Phoenix and he hasn’t been able to start it. So… it looks like Josh and Dad will not be traveling to Wyoming and will instead be staying with hubby and I! At least now I have the opportunity to share my new found recipes! Hubby landed a two week contract! It’s part time, a few hours each night, but it’s something! He has training on Monday and Tuesday and then he’ll receive assignments for the next two weeks. Praise the Lord! All our bills are paid for March. I am just amazed that we managed to pay every bill, on time, for this month without using any credit cards. God is very very good. I was planning on trying out a new French bread recipe today, but I realized this morning that I have to make a starter that sits out overnight. Oops. I should have read over the recipe yesterday when I decided which bread recipe I was going to bake today. I’ll make the starter either tomorrow night or Sunday night. Other than that, I’m still catching up on dirty laundry from my trip. Hubby was really good about keeping up with his laundry, so I just have to wash all of my clothes from the last two weeks and some towels from around the house. I didn’t even realize I had enough clothes to wear for two weeks without doing laundry. My dad will be arriving tonight and my brother will arrive on Monday, I think. They are driving up to Wyoming for a few days and then will be back here to stay for another week. I’ve seen my family more often in the last two weeks than I have in the last year. Being spread around the world makes it really hard to get together for dinner. My brother flew in Monday afternoon, safe and sound. He’s been working part time this week and our family has been spending the rest of the hours together. My dad, mom, and I are here all week. My niece was here earlier this week for a few days but had to go home last night. I’ll be here with my brother until sometime next week. And I have internet now! The furnished apartment we’re renting was missing a modem and it took a couple days to get one delivered. But I have internet now! (Can you tell I’m excited?) Now I can get back to helping my hubby job search plus keep up with my contract job.